Indian Ridge Country Club is one of Southern California's premier gated country club communities with a great location in Palm Desert. At the heart of the community lies the clubhouse that boasts world-class amenities and a social lifestyle that is scarcely matched by any community in the Coachella Valley. There are amenities for all lifestyles including two golf courses, 14 tennis courts, a fitness center, several pools, and a dog park. Residents can socialize with cocktails and games at the clubhouse. Indian Ridge Country Club is comprised of over 1,000 single-family and attached homes with a variety of sizes and prices. The prime location of this community offers residents access to an abundance of restaurants, shops and fun activities. At Indian Ridge, homeowners enjoy a plentiful lineup of exciting amenities. The 42,000 square-foot clubhouse is the beginning of an active lifestyle. The well-appointed clubhouse includes a full-service day spa, TV lounge, and card rooms for joining community activities. This clubhouse also hosts four restaurants and a full-service bar, a terrific option for joining neighbors for a drink or a quiet evening with your spouse. Residents can also enjoy the 22,000 square-foot Sports Club that has the latest strength and cardiovascular equipment as well as an aerobics studio. There are steam rooms and saunas for relaxing after a rigorous exercise routine. The terrific amenities continue outdoors. Tennis enthusiasts enjoy the 14 tennis courts, practice facilities and fully stocked pro shop. There are also two croquet lawns, two bocce ball courts, four pickle ball courts and a basketball court. Residents can also take advantage of the resort-style pool, lap pool and spa. There are also 34 sparkling pools placed throughout the community. The dog park, Rover's Ridge, is where residents meet daily with friends and their canines. There are two 18-hole Arnold Palmer golf courses where residents can play a great round of golf at their leisure. These award-winning private courses wind throughout the community and offer some of the most striking scenery in the Coachella Valley. Indian Ridge offers a wide array of golf events and activities from relaxed to competitive and is a centerpiece of Indian Ridge Country Club. Indian Ridge began construction in 1993 and completed the 1,068-home community by 2006. There is a wide variety of homes varying in size and price, each enjoying fabulous views of the golf course, surrounding mountains, and landscape. The monthly homeowners association fee covers maintenance of the common grounds and amenities, provides 24/7 security, cable, roof maintenance, and exterior painting. There are over twenty floor plans within the gates of Indian Ridge that provide buyers an option for every style and price. The Acacia patio homes offer 1,527 to 2,368 square feet of living space and feature two or three bedrooms, two to three-and-a-half bathrooms and an attached two or two-and-a-half-car garage. There are 21 different floor plans for the single-family homes ranging in size from 1,948 to 4,580 square feet. These homes have anywhere from two to four bedrooms, two to four-and-a-half bathrooms and an attached two-and-a-half-car garage. Life at Indian Ridge Country Club is like no other community with the wide variety of social clubs and events that are offered. Outdoor enthusiasts will have plenty of opportunities to meet like-minded neighbors with the hiking club, cycling club, golf tournaments, and the tennis group. More creative residents will enjoy taking part in the art group, photography club, or the taking part in the talent show. Indian Ridge Country Club also allows several opportunities for residents to get to know each other with several mixers, BBQs, several community dinners throughout the year and happy hours. Wherever your interests lie, Indian Ridge Country Club has a group or activity for you. Indian Ridge Country Club in Palm Desert, California is located on Country Club Drive in the beautiful Coachella Valley. It is conveniently located near Route 10 and the Palm Springs International Airport. Downtown Palm Desert and La Quinta are equally as close and provide residents with an abundance of shops, restaurants and entertainment. In addition El Paseo Shopping District is the ideal place to enjoy fine retail stores, restaurants, galleries and more. 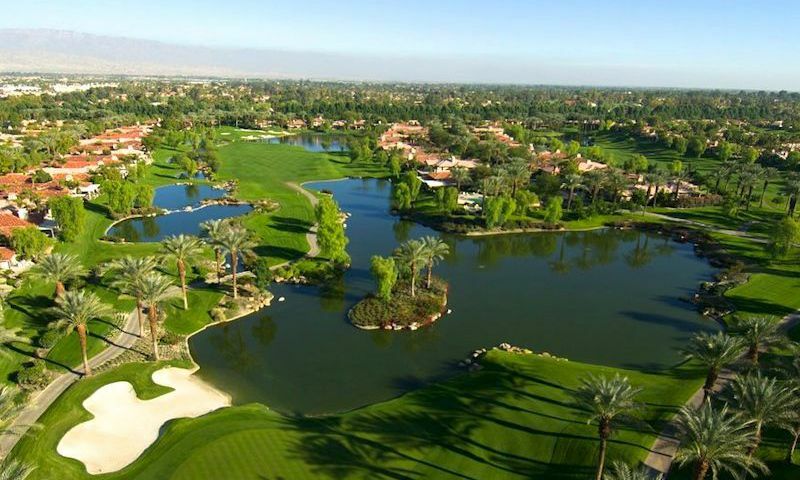 Palm Desert is the ideal location with an amazing selection of recreational fun. For an evening of live entertainment, residents can head to the McCallum Theatre for the Performing Arts, Arthur Newman Theatre, Palm Springs Art Museum, or Aqua Caliente Casino. Residents can climb one of the dozens of hiking trails, head over to Living Desert Zoo and Gardens, or enjoy the Palm Desert Aquatic Center. Palm Springs also hosts one of the most remarkable collections of golf courses in the world meaning that residents can enjoy a variety of fun and challenging rounds of golf. With bountiful amenities, beautiful homes, and gorgeous mountain views, Indiand Ridge Country Club is one of the most attractive active lifestyle communities in Palm Desert, California. The Main Clubhouse is the spectacularly appointed center for social activity at Indian Ridge Country Club. Inside residents will find four restaurants, a day spa, and card rooms for community gatherings. Clubhouse - 42,000 Sq. Ft.
Indian Ridge Country Club features two private Arnold Palmer-designed courses that weave through the community grounds. The Sports Club features 22,000 square feet of exercise space and hosts the tennis complex. Sports Clubhouse - 22,000 Sq. Ft.
Indian Ridge Country Club features several additional amenities throughout the community's 640 acres. There are plenty of activities available in Indian Ridge Country Club. Here is a sample of some of the clubs, activities and classes offered here. The Acacia patio homes offer six floor plans that range from 1,527 to 2,368 square feet of living space. These attached homes feature two or three bedrooms, two to three-and-a-half bathrooms and two or two-and-a-half-car garages. The monthly homeowners association fee covers maintenance of the common grounds and amenities, provides 24/7 security, cable, roof maintenance, and exterior painting. There are 21 different floor plans for the single-family homes ranging in size from 1,948 to 4,580 square feet. These homes have anywhere from two to four bedrooms, two to four-and-a-half bathrooms and two-and-a-half car garages. The monthly homeowners association fee covers maintenance of the common grounds and amenities, provides 24/7 security, cable, roof maintenance, and exterior painting. When we moved here I was most motivated by the golf courses but now that we've lived here for nearly a year I have found that there is so much more I enjoy. The restaurants are amazing, fabulous swimming pools and tennis facilities plus there is a dog park for our Mr. Zigs. We've meet lots of good people (and pets) at the park! My wife enjoys the photography club and book club while I play canasta and tennis. We both golf and she's even introduced me to the spa! Wish we would have moved here sooner! 55places.com is not affiliated with the developer(s) or homeowners association of Indian Ridge Country Club. The information you submit is distributed to a 55places.com Partner Agent, who is a licensed real estate agent. The information regarding Indian Ridge Country Club has not been verified or approved by the developer or homeowners association. Please verify all information prior to purchasing. 55places.com is not responsible for any errors regarding the information displayed on this website.